I’ma busy girl folks…which is my excuse for not blogging more often or keeping folks all involved in my bizness…. Yep…busy, busy, busy…we all are…Monday thru Friday, I am Office Manager busy….so I take my humor where I can. Friday, I see a photo pop up on my Yahoo! homepage and before I move to a work related website, it catches my eye…it’s a $55,000 cupcake. Subject: So…..it’s a win-win for both of us. 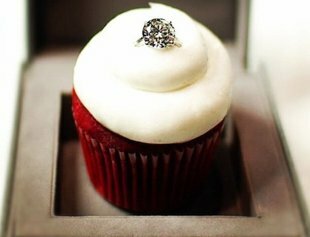 You get a red velvet cupcake…. Subject: RE: So…..it’s a win-win for both of us. Okay with me…while I eat my cupcake, you can eat your 8 carrots. And that was CARATS. Not CARROTS. At that point, I realized, I will….sooner or later….obtain said bling, just you watch….and the sign I got was as we went to shop for a new washer and dryer on Saturday…our stalker salesman was named Jared. As in the Galleria of Jewelry. This entry was posted in Funny Folks., the Boy, the Girl. Bookmark the permalink.